Some people have assumed that wild animals are fierce, so any pet with wild blood must be more likely to be fierce. It is true that one of the differences between a domesticated animal and a wild one is its ability to interact happily with humans, though more often than not small wild cats are more likely to be scared of humans than to attack them. However, a Bengal is not a wild animal. 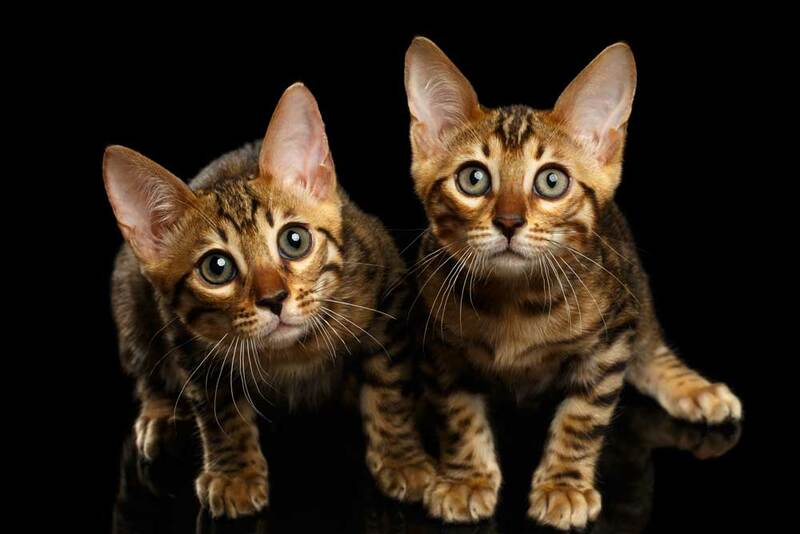 It is most definitely a domestic animal which has been selectively bred over several generations for character as well as appearance, and Bengals today should be no more aggressive (or defensive) than any other cat. There are reports of some difficulties with temperament very early in the Bengals development but for many years breeders have been working very hard on Bengal character, and these reports are no longer heard. We would have no hesitation in recommending the character of Bengals today. Our only note of warning is that, being so energetic, they are able to totally accidentally scratch people whilst galloping over them or jumping from them, so though this will be no problem for most cat lovers, it might be a concern if you have small children or find the occasional scratch a problem. In my experience, Bengals can be quite easily trained not to do things you dont like, simply by hissing at them to say stop. This seems a lot more effective than shouting “NO!” etc. since it is cat language for stop and shows them who is boss. Any hissing must, of course, be balanced by lots of affection, so they know you still love them! In summary, Bengals have very engaging, energetic, loving characters and this is one of the main reasons they are wonderful pets. Their character would not make them ideal pets for someone who wants a quiet, low key companion, but makes them amazing pets for people who want a more dog-like member of the family, along the same lines as oriental cats, but with many special features that make them unique and rewarding pets.